What do Ebru & Oil Wrestling Have in Common? It’s true that Ebru (the art of marbling) and Oil Wrestling don’t have much in common, however, they are both listed by UNESCO as cultural traditions requiring protection. When you think about the UNESCO World Heritage list, you generally think about places (and Turkey has many places on this list). But it is a lesser known fact that the good people of UNESCO also collate lists of cultural practices and traditions. In official speak, anything on this list is referred to as being “inscribed” on the Representative List of the Intangible Cultural Heritage of Humanity (phew, that’s a bit of a mouthful!). The things on this list are either practices, expressions, knowledge or skills passed from generation to generation, and considered to be worthy of preservation. In 2014 Ebru, made it to the Intangible Cultural Heritage list. 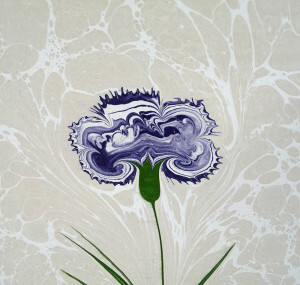 Ebru is the traditional Turkish art of creating beautiful, marble-like patterned paper, better known as marbling. Although Ebru is a Central Asian tradition, during the Ottoman era it was adapted until a style that was distinctly “Turkish” was developed. Ebru is done by sprinkling colours containing some drops of ox-gall on to the surface of a special bath, and then laying the paper over the bath where the floating picture is then transferred onto the paper. No two ebru prints are the same, and it generally takes around two years to become proficient in the art of ebru. The Kirkpinar oil wrestling festival made it to the list under the same category back in 2010. This festival is held in Edirne in July every y ear and attended by crowds of thousands. You can read more about it here. The Kirkpinar oil wrestling festival made it to the UNESCO list because of the rich social traditions associated with the festival, the fact that it is considered a kind of performing art, and the craftmanship surrounding the event (making the wrestler’s costumes). Getting something on to a UNESCO list is not an easy task. First, the Turkish Ministry of Culture and Tourism undertakes an inventory of all of those things it considers to be cultural heritage items and sends this list to UNESCO. UNESCO then undertakes a series of checks and balances before finally declaring a practice or a place as being inscribed on one of its lists. This process can take several years. Now that these two things are “on the list” so to speak, a number of measures by government, practitioners, academics and media will be undertaken to safeguard them for the future. This is a good thing for all of us, as these traditions contribute to the richness of Turkish culture today.